The newest title in the Welcome to the Museum series turns its focus to the heavens and explores the wonders of space. Welcome to the museum that is always open to explore. Step inside the pages of this beautiful book to discover galleries of galactic matter, expertly curated to bring you the experience of a fascinating exhibition in the comfort of your own home. Planetarium features all aspects of space, from the sun and our solar system to the lives of stars, the Milky Way, and the universe beyond. 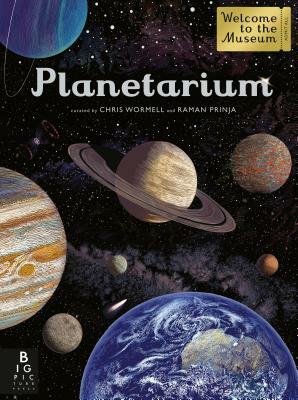 With stunning artwork from Dinosaurium illustrator Chris Wormell and informative text by Raman Prinja, a professor of astrophysics at University College, London, Planetarium is the perfect gift for budding astronomers and armchair stargazers alike. Raman Prinja is currently a professor of astrophysics at University College, London. He has written several successful general-interest books on astronomy and is keen to bring the subject of astronomy to a wider audience. He was short-listed for the Royal Society Young People Book Prize in 2015. Raman Prinja lives in the U.K.
Chris Wormell is a self-taught artist. He is the illustrator of Dinosaurium as well as the cover of Helen McDonald’s H Is for Hawk. He works using two main methods: wood engraving and linocut. He also writes and illustrates his own children's books. Chris Wormell lives in the U.K.